Job Opening-Youth Minister/Modern Worship Leader at Hazlehurst First United Methodist Church. 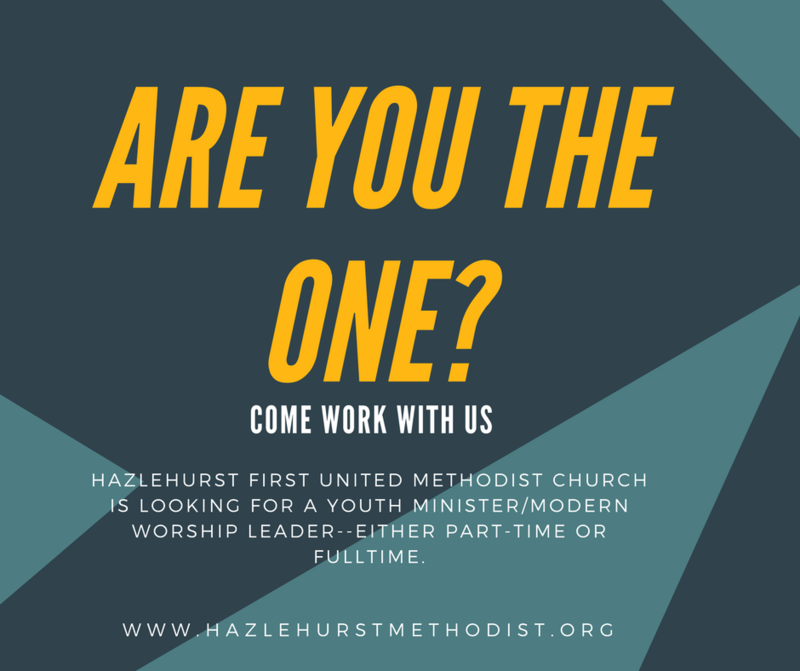 First United Methodist Church of Hazlehurst, GA is seeking a Youth Minister/Modern Worship Leader, with the possibility of it being either part time or full-time. Hazlehurst is the county seat of Jeff Davis County. We have a wonderful community with a great school system and a church that has always valued our youth ministry. Our church has a great youth facility and a lot of potential for ministry with our community’s young people. If you have a desire to help young people know and grow in Christ, please prayerfully consider applying. Responsibilities: Leading our Wednesday Night youth programs; outreach to the local school system; developing after school programs; overseeing the confirmation class; planning and leading all youth trips; and all other activities that involve our youth. Musical ability would be a plus. We can also offer a scholarship if the employee is in school.